Governments aim for ambulance services to meet these objectives in an equitable and efficient manner. 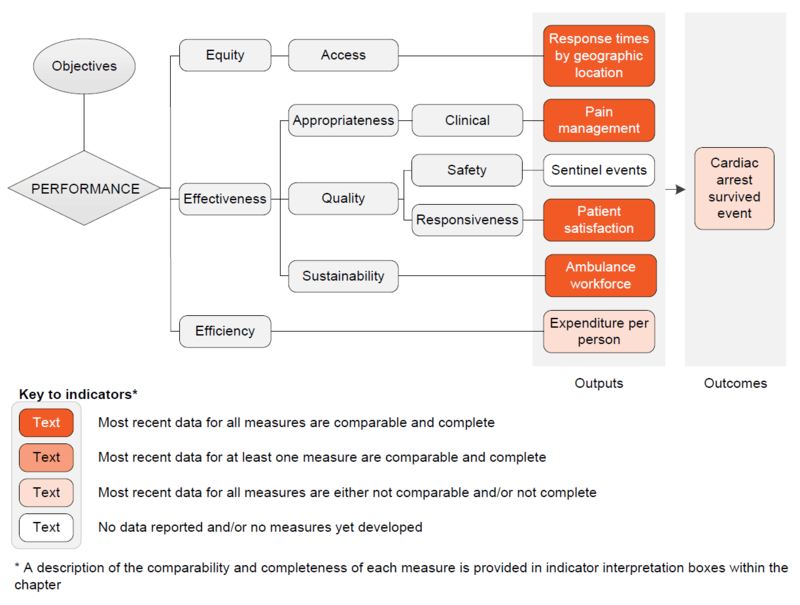 The performance indicator framework provides information on equity, efficiency and effectiveness, and distinguishes the outputs and outcomes of ambulance services. The performance indicator framework shows which data are complete and comparable in the 2019 Report. An overview of the Ambulance services performance indicator results are presented. Information to assist the interpretation of these data can be found in the indicator interpretation boxes in the Ambulance services chapter and attachment tables. 20.8 16.1 17.8 14.1 18.0 20.0 14.7 19.6 ..
23.2 19.1 17.3 14.8 19.9 29.4 14.7 21.0 .. These data and caveats for these data are available in chapter 11 and attachment 11A. Some percentages reported for this indicator include 95 per cent confidence intervals (for example, 99 per cent ± 2.7 per cent).